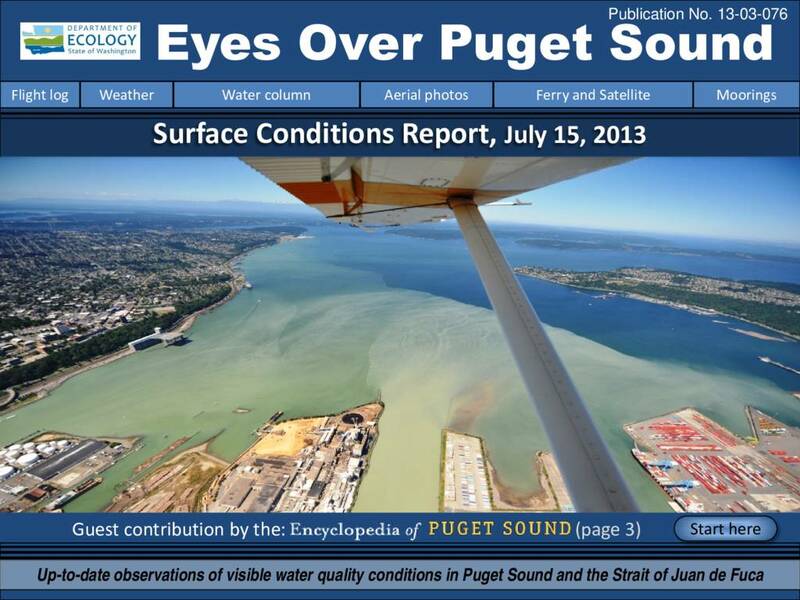 Abundant sunshine gives rise to large algal mats in South Sound, Hood Canal, and Sinclair Inlet. Red-brown algal blooms dominate in Budd, Totten, and Eld Inlets and jellyfish begin to increase. Northerly winds push algal blooms from Whidbey and Central Basins past Seattle and a bloom in northern Hood Canal southward. Satellite thermal imagery shows patterns of near-surface mixing and injection of nutrients into the surface layer. Glacial-fed rivers deliver glacial flour into Commencement Bay, stratifying the water and supporting different colored phytoplankton blooms (green, brown, and red). Since the beginning of 2013, dissolved oxygen is dropping below expected values. Description Abundant sunshine gives rise to large algal mats in South Sound, Hood Canal, and Sinclair Inlet. Red-brown algal blooms dominate in Budd, Totten, and Eld Inlets and jellyfish begin to increase. Northerly winds push algal blooms from Whidbey and Central Basins past Seattle and a bloom in northern Hood Canal southward. Satellite thermal imagery shows patterns of near-surface mixing and injection of nutrients into the surface layer. Glacial-fed rivers deliver glacial flour into Commencement Bay, stratifying the water and supporting different colored phytoplankton blooms (green, brown, and red). Since the beginning of 2013, dissolved oxygen is dropping below expected values.